Pamper your pony with our range of grooming products. From goat hair to magic brushes. The HAAS Cavaliere grooming brush has a bristle border that is longer for optimum cleaning results. The strength and elasticity of this select mane and tail mixture ensures a brush of high quality. The guarantee for a shiny coat, perfect on its own for grooming before and after riding. Suitable for use on the face. The HAAS Diva brush is made with Lambswool and the Border with soft Horsehair. For a perfect, glossy finish. Black with Leather Handstrap. Diva is made of lamb wool so it does change after washing it. However it does not effect the way it's working. The final polishing brush suitable for the most sensitive of horses. Perfect for the mane and tail as it will not pull out any of your horses natural hair. 5CM Bristles. The Groomi is a shedding tool designed for horses, dogs & cats. It removes dead hair, dirt and other nasties from pets' coats gently but with dramatic results. Proven to reduce shedding when used regularly, encouraging healthy and happy pets. Triple action. Thins, combs and cuts the mane & tail. Easy to use, easily replaceable blade. Comfortable handle and improved blade angle for better cutting action. Available in Pink. The miracle brush is for all Horses and Ponies with all types of hair and really does work miracles! Gentle on the Coat. Available in several colours! Dark brown lacquered curved brush with horse hair bristles and ergonomic finger slots for added grip when brushing. Perfect for flicking the dirt away after curry combing. Follow this with they HySHINE Body Brush Horse Hair Mix and finally the HyShine Goat Hair brush for glossing/sensitive skin. Perfect for use before and after exercise or combined with the HyShine range of horse and goat hair brushes. Combine with the HyShine Miracle Brush, Horse Hair Flick curved and HyShine Goat hair for that complete grooming experience. Perfect for use before and after exercise or general grooming and relaxation The deluxe body brush features soft goat hair and an inner massage pad. This will help with increasing blood flow, sooth tired or aching muscles and encourage relaxation. Dark brown lacquered medium oval brush with goat hair and leather strap. Creates Shine for that finished look and perfect for horses with sensitive skin. Perfect for smaller hands and ponies! Dark brown lacquered medium oval brush with goat hair and leather strap. Creates Shine for that finished look and perfect for horses with sensitive skin. Dark brown lacquered metal mane comb. Finish your grooming set with this handy product to help detangle mane and tail. Dark brown lacquered hoof pick complete with a brush. Tan wooden flick brush with gold/black/beige bristles and ergonomic finger slots for added grip when brushing. Natural colour medium oval body brush with teal, black and white mixed soft PP bristles and PP strap. 19.5cm x 9CM. Two tone, round head mane and tail brush. A brush with soft white horse hair for extra shiny results with a leather hand strap. This brush is great for creating shine on any colour horse! An exclusive horsehair mixture is used for this brush. The rim is edged with longer black horsehair for removing dust and the shorter bristles for gentle cleaning creating a glossy coat. We have used selected horsehair and natural bristles with the smallest amount of synthetic fibres to manufacture this brush, The selected combination of the bristles ensure that this brush has exvellent cleaning properties. The back of the brush is a wooden design with a leather hand loop. We have used selected horsehair and natural bristles with the smallest amount of synthetic fibres to manufacture this brush, The selected combination of the bristles ensure that this brush has exvellent cleaning properties. The back of the brush is a wooden design with a leather hand loop. Combined with a HAAS Junior new generation curry comb and a storage bag (available in three colours) this set makes the perfect gift any time of the year. A particularly strong horsehair mixture has been used for this brush. The border is edged with longer bristles to remove dust and the shorter, stronger bristles are for a thorough cleaning effect. This is the First brush for Light Bay and Chestnuts, it is perfect for removing dirt and stains from finer coats. For this brush we use a mixture of grey and black horsehair. 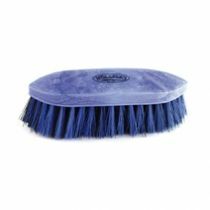 The combination of bristles creates a superior cleaning result.This brush is most effective on Dark Bay / Black horses. A special brush for white horses. Using strong coconut fibres tha are ideal for removing tenacious stains on white or multi coloured horses with white patches. A high specification tack box suitable for all equestrian needs. Features a removable tray for convenience. Dimensions(mm): 394x215x195(h). A brilliant bag in a variety of colours. Suitable for storing hats, grooming essentials, general horsey bits and pieces.